and what that response would look like in the body/facial language of that person. That's the brass ring... the ultimate goal you should be reaching for. From the answers to those 4 questions you can choose the tone, volume, phrasing and vocal embellishments that you need to get that specific response. No matter, the only thing that matters is that the heart you're singing to feels it. Because it's not about you, there is no need to get nervous. No current relationship? Oh I beg to differ. We can sing love songs to our pets, our parents or grandparents, our friends, to the one heart of our audiences, to GOD, really to anything we love. And sometimes we need to sing love songs to ourselves. Patty Griffin wrote her love song, "Heavenly Day," to her dog. The point is, our choice of whom to sing to, should change the way we sing. Focus on that heart. Mixing your messages. Unless you're going for coy or confused... which actually become the central message, 'I'm being coy' or 'I'm so confused'. Delivering your messages to the wrong place (anywhere the lyrics are not addressed to). Failing to fully intend and commit to your delivery. Singing a song that's out of your wheelhouse of experience. This is why I don't like young kids singing mature adult relationship songs. They may nail the high note, but not the emotional response. Over-emoting. Sometimes the power is in what you don't do. Leave room for your audience's imagination. Don't lose the realness of your delivery by trying too hard. As Star Wars' character Yoda says, 'Do or do not - there is no try'. 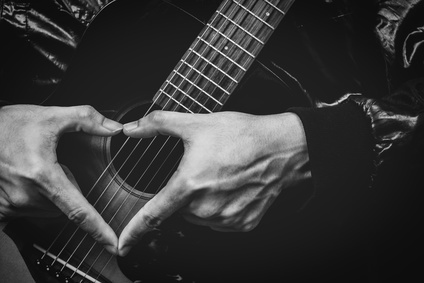 To really sing (or write, or play) a love song in a way that effectively captures the intended heart, you have to be able to perform in multiple nuances of human language. Vocal nuances require changeable external facial/body movement, fine control of breath, and morphing of the throat channel to create differing tone colors. with very wide open eyes, then squinting. with a tight jaw, then while making chewing circles with your jaw. while over-articulating the words, then while slurring or mumbling the words. with a very flat, frozen soft palate, then with a yawny lifted palate. while standing with your arms on your hips like supergirl/superman. then while crossing your arms over your chest. while standing stiffly frozen, then while swaying, moving your arms/hands or lightly dancing. 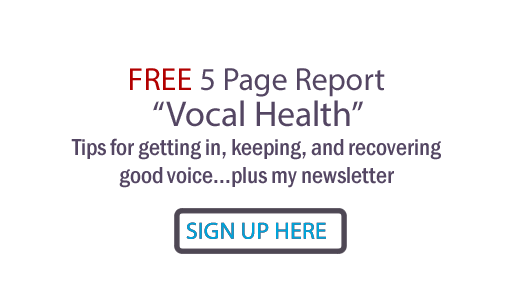 Ask yourself... what does any of these changes do to the sound of your voice? Do you see how you can deliver different messages with the same words? Ask yourself... what did you have to do, to change, to get those different messages and their respective responses? OK so it's your turn: What's your favorite love song to sing? To hear sung to you? Hope this helps you deliver some love on Valentine's Day! Hi Judy. I just finished watching all these videos and Whitney Houston is my favorite. Before her personal problems she had a beautiful voice over an impressive span and easily sung high notes without screaming. To this day her National Anthem at the Super Bowl is the best rendition I've ever heard. Being Italian, I've never had a problem emoting! Singing church music requires a harness on the Italianate delivery but pieces like the Bach Ave Maria happily allow an operatic style. As I get older and see my grandsons in church, I sometimes get very emotional, thanking God for such wonderful gifts. Tears begin to well up and I have to quickly gain control before the next hymn or mass part. Tears of joy and singing don't seem to work too well! Thanks for this very informative and entertaining blog. You are most welcome, Linn... glad you enjoyed this post! Hi Judy, this is FiFi Cox from New Zealand :) and I'm still enjoying your podcasts! This one is especially timely regarding the chorus competition in just under three months time. Will keep you posted! Happy Valentines day Judy! Great to hear from you Fifi... so happy you enjoyed this episode! Yes, let me know how it goes for your competition!